It’s time to get ready for the first day of school, and we have prepared a list of of resources to ensure your children are ready for the 2017-2018 school year. This entry was posted in News, Parents and tagged Back To School on August 16, 2017 by HISD Communications. 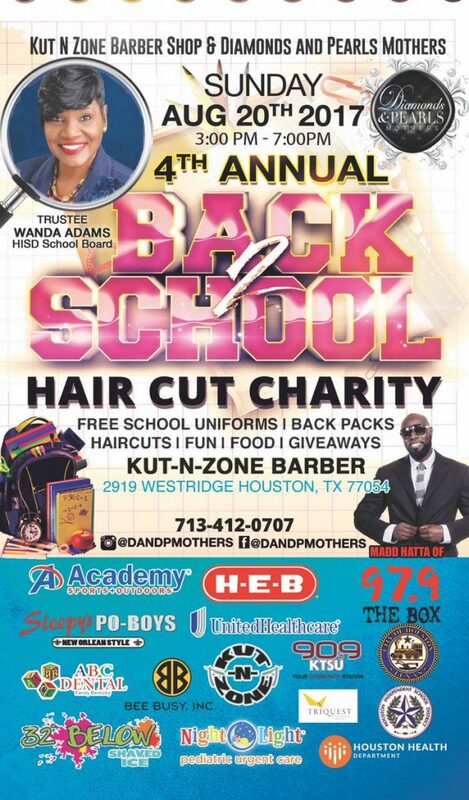 HISD Board of Education President Trustee Wanda Adams of District IX, along with Kut N Zone Barber Shop and Diamonds and Pearls Mothers, will host a special back-to-school event on Sunday with free haircuts, school uniforms, backpacks, food, fun and other giveaways. The fourth annual event will be held at Kut N Zone Barber Shop (2919 Westridge 77054) from 3 to 7 p.m. The event is sponsored by HISD, Houston Health Department, Kut N Zone Barber Shop, and a long list of other sponsors. For more information, call 713-412-0707. This entry was posted in District IX - Wanda Adams, News, Parents and tagged Back To School on August 16, 2017 by HISD Communications. Schools included in HISD’s Achieve 180 initiative are kicking off the 2017-2018 school year for their parents, students, and communities surrounding their campuses with everything from dance parties and parades to free school supplies, immunizations, and dental care. This entry was posted in Achieve 180, District II - Rhonda Skillern Jones, District IX - Wanda Adams, Elementary Schools, High Schools, Middle Schools, News and tagged Back To School on August 16, 2017 by HISD Communications. Parents and community members can have their back-to-school questions answered by the superintendent and learn more about what’s new in the 2017-18 school year by tuning in to a live, interactive broadcast on Monday, Aug. 21. Superintendent Carranza and his staff will take questions during a discussion that will be streamed live on HoustonISD.org, Facebook.com/HoustonISD, and on HISD-TV (Comcast 18 and Uverse 99). There will be two opportunities to join in the conversation: from 5:30 to 6:30 p.m. for Spanish-speaking community members, and from 7 to 8 p.m. for English-speaking community members. Parents can submit questions ahead of time by emailing Back2School@HoustonISD.org , posting a Tweet with the hashtag #Back2School, or posting a question at Facebook.com/HoustonISD. Questions can also be submitted during the live event. The live broadcast will also provide an opportunity for the community to learn more about HISD’s initiatives for the new school year, including Achieve180, which is a plan to support the district’s 32 underserved campuses; restorative justice practices; wraparound services; and literacy. There will also be an update on the district’s new bond schools, nutrition in HISD, and fine arts. This entry was posted in Early Education, Elementary Schools, Fine arts, High Schools, Middle Schools, News, Parents and tagged Back To School on August 10, 2017 by HISD Communications. Parents have the opportunity for some extra back-to-school savings during Texas’ annual Sales Tax Holiday on August 11–13, 2017. The holiday provides exemptions from state and local sales taxes on most clothing and footwear priced at less than $100, saving shoppers about $8 on every $100 they spend. Many retailers offer sales and special promotions over the weekend, so shoppers can maximize their savings. For complete details, please visit TexasTaxHoliday.org. This entry was posted in News, Parents and tagged Back To School, sales tax holiday on August 8, 2017 by HISD Communications. 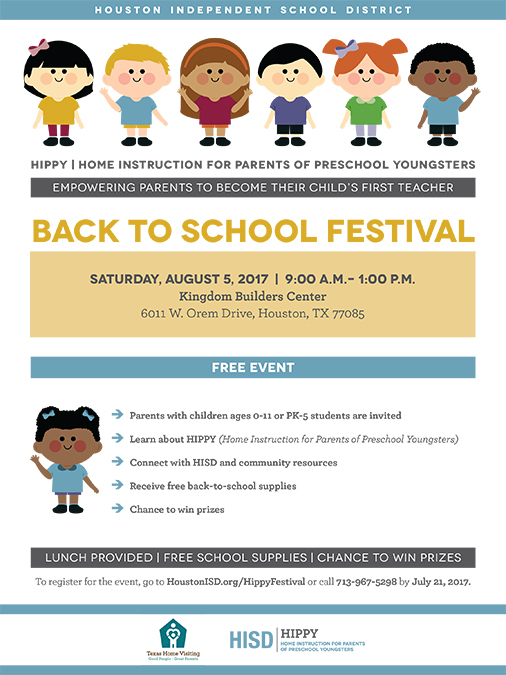 HISD’s Home Instruction for Parents of Preschool Youngsters (HIPPY) will hold its Back to School Festival from 9 a.m. to 1 p.m. on Saturday, Aug. 5 at Kingdom Builders Center (6011 W. Orem, 77085). Parents of children ages 0-11 or in grades pre-K through 5 are encouraged to attend. At the event, parents will be able to learn more about the HIPPY program, connect with HISD and community resources, receive free back-to-school supplies, and have the chance to win prizes. Lunch will be provided. To register, go to HoustonISD.org/HippyFestival or call 713-967-5298. The registration deadline is July 21. HIPPY works with parents of 3- and 4-year-old children to help prepare their preschool child for academic success. Instructors visit parents in their homes for an hour a week in a 30-week period and cover early literacy skills, mathematics, science, fine and gross motor skills, and language development. Research shows that HISD kindergarten students whose parents have participated in the HIPPY program significantly outperform their peers in reading and math. Interested families can contact the HIPPY office at 713-967-5298. This entry was posted in Elementary Schools, HIPPY, News, Parents, Preschool and tagged Back To School, Back to School Festival, HIPPY Back to School Festival on June 28, 2017 by HISD Communications. This entry was posted in Parents and tagged Back To School on August 16, 2016 by HISD Communications. 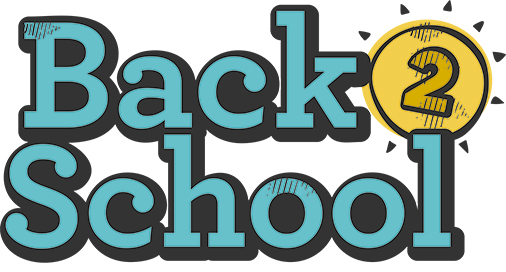 Classes start on Monday, Aug. 24, but just a few days before that, HISD’s Homeless Education Office will help you get your child ready to go back to school. This entry was posted in News and tagged Back To School, Homeless Education Office on August 12, 2015 by HISD Communications. About 6,800 HISD third-grade students will get free backpacks full of supplies, thanks to the NCAA. This entry was posted in Elementary Schools, Volunteers and partnerships and tagged Back To School, NCAA, Strategic Partnerships on July 29, 2015 by HISD Communications.